Ragamuffin Diaries – thoughts and musings of a truly perfect mess of a woman serving a truly Perfect God. How long does it take to love a puppy? Who doesn’t love a puppy? More accurately, who does a puppy not love? 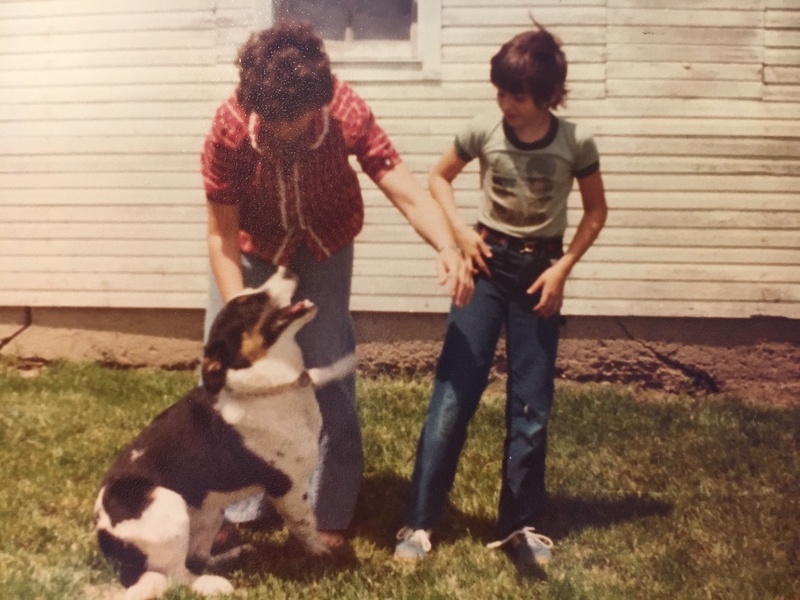 Those arguments and many others were what my son used to plead his case for getting a dog. My arguments were just as valid and thrown right back at him; Puppies are a ton of work, much like a baby. They have many ‘accidents’, need constant supervision, special food, and medical care. Puppies grow into dogs which are a life-long responsibility, not a fad or a toy and can be expensive. Spencer assured me he knew all these things and was prepared. I, on the other hand, was not. Therefore I did my due diligence and Googled information about the breed he wanted: a beagle. That led to more ammunition for arguments against having a puppy. However, my son was prepared with answers and I finally started warming up to the idea. My mom tries to keep Rags from jumping on my sister. Contrary to what my friends might think, I’m not a dog-hater. My experiences with dogs although, have mostly been negative. 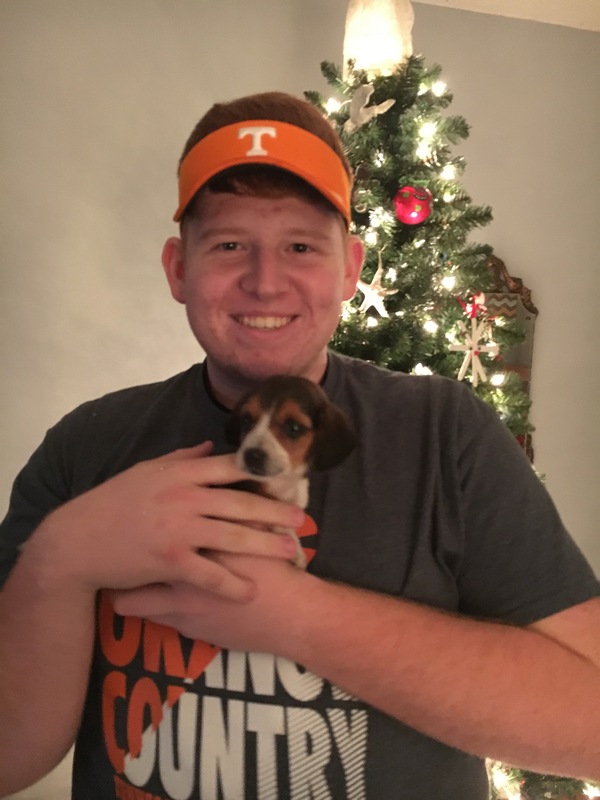 As a girl, my sister and I begged to take home a puppy from a cookout we were at, and we got our way. The mixed breed puppy grew into a very large dog that should have been walked and exercised every day. Instead, Rags was chained up in the backyard. After my parents divorced and we were no longer there to play with him, he became aggressive and I became afraid. Thirty years later a very similar incident took place with my kids. We were at a family Christmas party where puppies had been born a couple of months earlier. The kids begged to take one home and I was adamantly against it. My huge mistake was leaving them with their Nana to take home later that night. After more pleading along with being besieged by other family members, I relented and the kids came home with a puppy. Max was also a mixed breed: Great Pyrenees and labrador, I found out later. After several chewed up valuables and many ‘presents’ left for me to clean up, Max was fenced outside, but not for long. Max should have been named Houdini. No matter what we did, he escaped. And grew, and grew, and grew. He soon became bigger than my daughter and she quickly became frightened of him. He had the energy of a puppy but was larger than most full-grown dogs. Seven months after his homecoming, we took him to a distant friend’s house in the country on several acres of land with a creek. Max provided protection for her and she provided lots of room for him to roam. 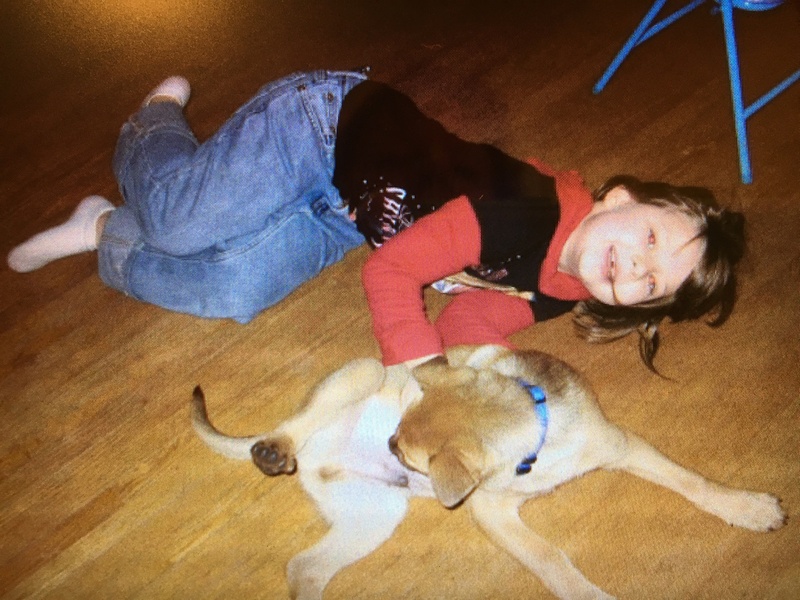 Nearly ten years later my son still wanted a dog. Two days after Christmas, Tuesday, I found myself driving to a breeder just over two hours away from our home. I was still not agreeing verbally, only saying IF . . .
Then…I held a seven-week-old beagle puppy in my hands. He was wrapped in my sweatshirt all the way home in my arms. I was in love in about five minutes or less. So was Spencer. After some discussion, he named him Cooper. Spencer and Cooper the day we came home. How long does it take to love something? Is there a time-limit to prove that you really do? The term puppy-love refers to a superficial love that a teenager has for someone else, usually it’s quick and doesn’t last. Although this was my son’s puppy, I cared for Cooper as if he were mine. Spencer paid for him, bought supplies and took him to the vet, however, I was right there with him. I took pictures…lots of pictures, and used the word ‘precious’ to the point my son got angry. I definitely had puppy-love. I was a little surprised by day two, Wednesday when Cooper wasn’t as playful as I expected. I chalked it up to the anxiety of a new place and being torn from his litter-mates. Then he vomited up his food and I became concerned. We were already going to take him to the vet, now it seemed urgent. The quickest we could get an appointment was Friday. Until that time, we took turns loving on him and trying to get him to play and eat. Mostly he just wanted to sleep. Cooper slept best when he was curled up on your chest or in the crook of your arm or neck. He didn’t cry at night after that first night. That caused me to be anxious also, but then again, I didn’t know a lot about puppies. Maybe he adjusted quickly. By Thursday, the whole family was worried. After several had told us Cooper seemed awfully small for a seven-week-old, Spencer looked up images and indeed, he was. Cooper compared more to a three or four-week-old puppy. Friday morning came and Spencer and I were at the vet with Cooper. A friend had mentioned parvo (a deadly and highly contagious viral disease), which was one of my main concerns, along with his size. After a quick check, the vet said Cooper was just small for his age because she looked at his teeth. She didn’t seem too bothered about parvo, so that put our minds at ease. Cooper got his shots and worming medicine and we were off. Cooper went downhill after that. Saturday, New Year’s Eve, he was not just sleepy, he was lethargic. I tried to justify it in my mind that babies sometimes have reactions to shots, so this was probably similar. I tend to dramatize everything, anyway, so I was sure he was going to be fine. He had diarrhea that afternoon. Obviously, he didn’t feel well. But by now the vet was closed. Was this parvo or did Cooper have other problems? That evening Spencer went to a party but made sure I was going to watch Cooper. I watched him, but there was nothing I could do to help. I searched the internet for help, but found none. I discovered that death was probably the only outcome. I never verbalized it and put down my phone. Cooper was laid in his bed around 10 p.m., as we were going to bed. At 11 p.m. I heard a terrible high-pitched cry, like a seagull. I got up and saw him laid out, eyes closed. I picked his lifeless body and knew immediately he was dying. Watching a living thing in pain and not being able to relieve it is soul-crushing. In the midst of my tears, I prayed for him to die quickly. I knew we were not able to stop it. My husband picked up my son from his party and as soon as he got home, he cradled Cooper in his arms until he passed around 3 a.m. In all my arguments against having a puppy, parvo and death were not among them. Neither crossed my mind and now I can’t get either out. Will I allow my son to get another puppy? I don’t have an answer. Actually, I don’t even want to talk about it. I don’t even know if he wants one. He is just as heartbroken as I am, but not as verbal. I’ve already heard and read how deadly and contagious the parvovirus is to puppies and dogs that aren’t vaccinated. We don’t know for certain if Cooper had this, but it’s extremely likely from what I’ve gathered about the symptoms. The breeder said none of the other puppies had it, and offered to return my son’s money. Maybe some people aren’t meant to have dogs and I’m just one of them. This experience, though extremely painful, has given me some answers. It takes less than five minutes to love. I do love puppies. And our puppy Cooper did love me. Thank you for reading. If you liked this post, please consider sharing. Thank you. Writing about it has helped some. Sharing the grief seems to have lessened it a bit. I’m glad for that…wish I could do more. What a shock. I was reading along, thinking “Oh boy, a beagle, he’s going to be a handful” — beagles tend to be smart and independent, sort of like malamutes — and then suddenly poor Cooper was sick, getting sicker, and dying. You’re so right about how once something bad happens, the possibility of it happening again looms very large in your mind. (This happened to me when one of my retinas detached in 2004. Before that I barely knew what a retina was.) But time does help put things back in perspective . . . Previous Previous post: So, this is Christmas? Next Next post: Should the church be called a hospital? Find a post . . .